of Colorado for 15 years. Bill studied Music Education and Theater at Ball State, and then traveled the country as a professional musician, playing country, rock, and jazz. He has played music from Edmonton, Canada, to Jackpot, Nevada, Jacksonville, Florida, to Nashville, Tennessee at the Nashville Palace, and has worked as a session player in studios in Nashville, Tennessee and Indianapolis. He played piano bar on Jacksonville Beach, Florida, entertained on a cruise ship, and has headlined in Indianapolis and here locally in Greensburg. 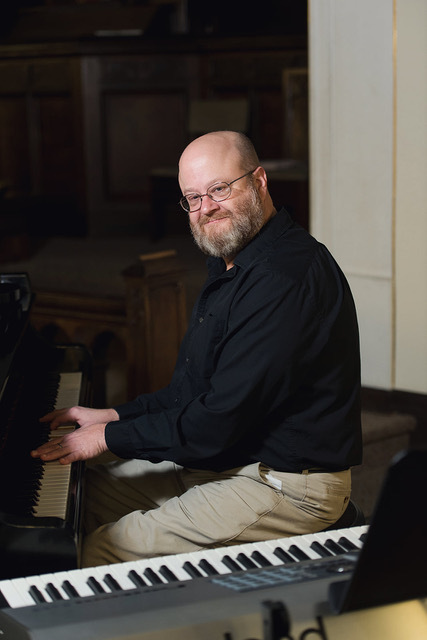 Bill spends his free time lending his talents as a musical director for stage productions with Tree County Players and Rural Arts Alliance, and currently works as a reporter for the Greensburg Daily News. He enjoys spending time with his dogs and making music with his friends. 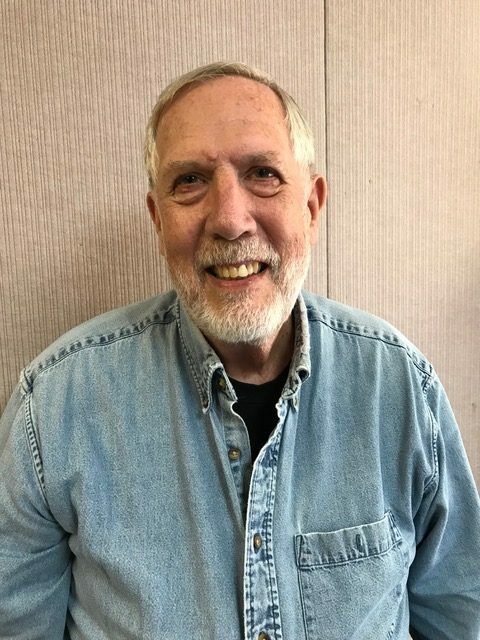 Bill was ‘instrumental’ in the purchase and installation of the new sound system in the sanctuary at GUMC, and enjoys working with the lead pastor and the musicians in improving the quality and appeal of both traditional and contemporary worship at the church. He works with the Praise Band and the Chancel Choir, and coordinates all of the music for worship at GUMC. Jared was born and raised in rural northern Indiana. Along with his parents, he faithfully attended Salem United Methodist Church, where he actively participated in the church choir. He received formal training in piano, trombone, and vocal performance throughout grade school, high school, and college. 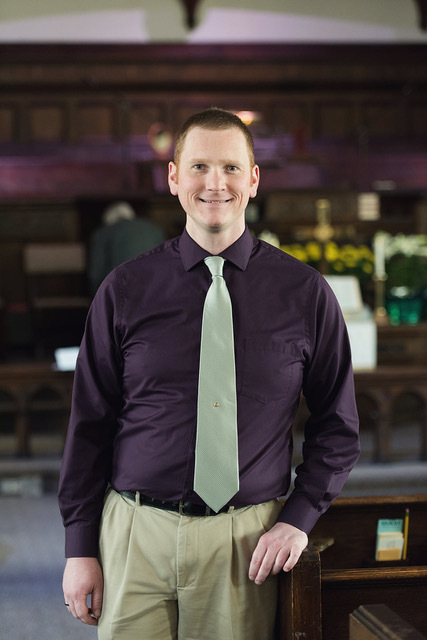 While pursuing a Bachelor of Arts in Political Science at Ball State University, he had the privilege of auditioning for and being accepted into the Chamber Choir – the top auditioned choral group at BSU. The choir season culminated with a 12-day European tour featuring performances at notable locations including St. Mark’s in Venice and Notre Dame Cathedral in Paris. Professionally, Jared has served in many roles at the Social Security Administration since 2005. During this time, he pursued and received a Master of Science in Management from Indiana Wesleyan University. He is the proud father of two beautiful daughters, Mallory and Lillian, who keep his calendar full. When not working, performing, conducting, or parenting, he is an avid world traveler and is actively involved in the Greensburg community. Becky was born and raised in Greensburg, the only child of Bob and Billie King. As a young child, she had open heart surgery, which kept her from playing sports, so she spent a lot of years participating in various forms of dance at Dixon Dance Studio. She is a 1997 graduate of Greensburg High School. Becky has three sons: Kyle (23), William (11), and Henry (8). They are all members of St. Mary’s Parish in Greensburg. Becky’s favorite thing to do is watch her children play sports, especially baseball and football. Becky describes herself as a social butterfly, and loves to go, go, and go. 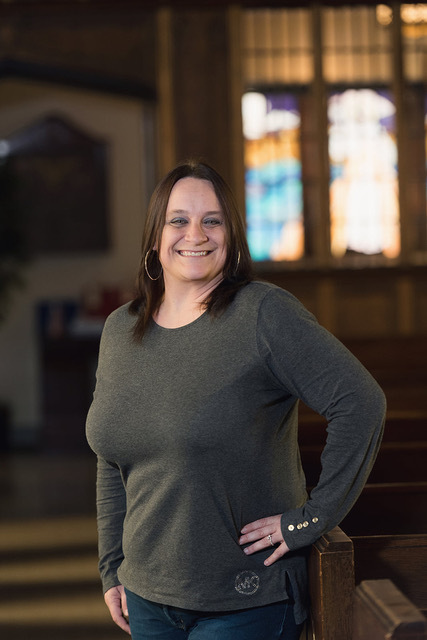 When her schedule isn’t full of youth sporting events, she enjoys shopping, watching professional baseball (especially the Cincinnati Reds), watching movies, reading, and singing karaoke with her cousins in Indianapolis. We believe that Jesus is the Christ, the Savior who came to earth in the flesh to reveal God to humans and to restore all of fallen humanity to a personal relationship with God. We believe Jesus was conceived of the Holy Spirit and born of the virgin Mary; he is both fully human and fully God. Jesus lived a perfect, sinless life and embodies the truth about God and the Truth of God. Jesus willingly died on the cross to demonstrate God’s love for sinful humans and to provide salvation for all humanity. His sacrifice in our place provides all humans the means to be reconnected with their loving Creator. We believe in the physical resurrection of Jesus from the dead. Jesus ascended into heaven, where he rules as our Lord (absolute authority) and advocate. Jesus will return to earth in the future to establish God’s perfect peace and justice for all time. We believe in the divine personhood of the Holy Spirit as an equal part of the Trinity. The Holy Spirit is God present, living within each follower to empower a life that reflects the lifestyle, values and character of Jesus. The Holy Spirit is the change agent in the lives of Jesus’ followers, illuminating God’s word for understanding and application in the life of each. The Spirit is involved in progressively transforming each follower into the image of Christ, and is actively working within the Christian community and world at large to bring about God’s plan of redemption for all people and all creation. We are an inviting Christian fellowship where people are striving to put God’s love into action in their everyday lives. Come join us on Sunday mornings as we discover the love of God in community with one another. We believe it is the calling of every Christian to live out, in word and deed, the gospel of Jesus Christ and continue to do the work to which God has called us: to help reconcile people back to God in Jesus Christ (II Corinthians 5:18-19). This occurs through the preaching of God’s Word, as well as through loving and inviting relationships. God has called us to be in community, and we believe that it is through demonstrating a loving, inviting, accepting community that people will be drawn into relationship with Christ.